PRODUCT DESCRIPTION: New and improved formulation making this one of the best organic concentrates available. Made from pyrethrins (.24%) and potassium salts of fatty acids (20%). 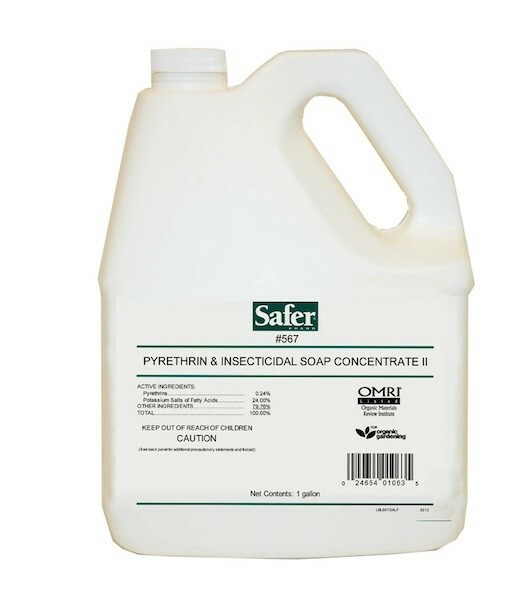 Kills soft and hard-bodied insects like caterpillars, cockroaches, beetles, whiteflies and a wide range of bugs like mealy and stink bugs. Safe for use up to the day of harvest. OMRI Listed® and compliant for use in organic gardening making this a great choice for tough pests like white flies, aphids and pretty much any kind of garden pest. WHERE TO USE IT: Flowers, Fruits, Lawns, Trees, Shrubs and Vegetables. RATE OF APPLICATION: Mix 6.4 oz of concentrate to one gallon of water. Apply over 500-750 sq/ft of plant surface area per mixed gallon. Product can be used daily if needed since it has 1 day to harvest. If it doesn't rain or if there are no pests present, apply every 1-2 weeks to maintain a pest free garden. Does this affect bees? If so, any suggestions? I am having an aspen leaf miner problem, but this looks like it'll take care of a lot of issues down the road. Thanx. Bees and wasps will detect its presence and move on. Basically they're repelled by it so they won't move over treated plants thus avoiding any chance of getting hurt. Will this be effective in spraying outside for carpenter ants? How frequent do I need to spray? I have toddlers and a dog in my home so don't want to use toxic spray. In the article you'll learn about two baits which are highly effective on carpenter ants. And this is true even if there are nests close by. The great thing about using bait is that it poses no risk or hazard to non target animals like people or pets. Basically if your pet or child was to ingest any, their digestive system would render the material harmless and it would be digested like any other food. But when placements are made properly, this wouldn't happen because the bait will be placed so "thin" around the yard and home that in theory, it would be near to impossible for any child to find it and if done right, even hard for a pet to notice. The concept is easy too. Basically you'll sprinkle small amounts of Carpenter Ant Granules around the home, in the turf and basically anywhere you see them active outside. It doesn't take much so no need to over apply. When done right, you're placements should barely be visible. For inside activity, apply small dabs of carpenter ant gel where they're active. Placements should be high up, out of any small child's reach, and small. No bigger than a grain of rice is needed per spot. This allows you to bait discreetly in "out of sight" areas where only the ants will find the offering. (1) will an application of this product, or similar (i.e. liquid Sevin) on bagworms now have any benefit? Have just discovered bagworm infestation on backside of Leyland Cypress trees. They are in their cocoons now. (2) these trees are at least 30 feet tall, are there sprayers available that could be used to apply product to this height? Or will I need to hire a professional to apply? We have not seen positive results using liquid sevin. And though Multipurpose Insect Killer is much stronger and will can handle the job, it will probably take two treatments spaced 7 days apart to assure success. So even though some of your bagworms may be in cocoons, there are plenty of active adults and eggs that can hatch during the next 2-3 months so you need to treat now. And once we get to the second half of the season (July-October), we have found the Bifen and Spreader Sticker to be the best product to use. It will generally do the job with just one application. It has extra "penetrating" power and this better suited for the more mature stages. As for reaching 30 feet high tree canopies; you have two options. First, test the water pressure going through your exterior hose spigot. If it can spray 30 feet or more using your garden hose, use one of our Hose End Sprayers. They're made for this type of job and I know mine can reach just over 30 feet no problem. The second option is our Trombone sprayer which can reach over 25 feet for sure; over 30 feet for most any "strong" person or someone standing on a step ladder or other elevated platform. Do you think this will work on cicadas? It works well on hard bodied insects including cicadas. Will this product work on colorado potato beetles? Yes. In fact it works well for any kind of beetle which we can't say about most garden safe products. As you can imagine, beetles have tough exoskeletons but this product will get through this protection within minutes and treatments will keep working for a week or two. This product is approved for organic gardens and only the "safest" products can be sprayed on vegetables and fruit intended for human consumption. This means when used in the yard over turf and plants where people or pets might be active it won't pose any type of hazard. Will this kill grasshoppers and crickets??? or can you recommend the best organic spray to kill them, thanks. Though the label doesn't include grasshoppers or crickets, it will definitely kill them. Both these pests can be tough but this spray will penetrate their exoskeleton and knock them down quickly. And you can use it daily since it has just a single day to harvest wait time which is nice when needing to treat a vegetable garden. So far it's working just fine. I have a blister beetle infestation in my grass (we have mowed weeds for a lawn). Will this product kill grass? Also, I would be happy to control a wolf spider over population as well. Any chance of repelling them? I kill one per day in my basement. Second, this product, the Multi Purpose Insect Killer, might be organic but its strong enough to kill any beetle or spider. And though it won't keep killing as long as the other items listed in our article, it will repel the spiders for at least 2 weeks if not longer. I am having a hard time getting the seeds to grow in my garden. I am thinking it is due to the rolly polly/potatoe bugs which are plentiful in the ground. Do you have something that will get rid of them even if there are very few plants growing yet? I need something to treat the bugs in the ground so plants can grow. There are several things which could be causing issues including the bugs you listed. And yes, treating the ground anytime will help. Remember, these ground nesting bugs will be there year round so you can effectively spray for them whenever you want. And if you renew treatments a few times a year, you can stay ahead of their developing populations thus ensuring your plants will have their "best" chance to survive starting from seeds. So at this time I'd say the Multi Purpose Insect Killer (shown above) would be a great product to use. Though organic, its quick acting on most any garden insect and fine for use where you intend on growing vegetables or fruit. Mix 6 oz per gallon of water and spray the mixture over no more than 500 sq/ft per mixed gallon. You didn't cite how big of a lot you want to treat so I don't know how many mixed gallons you'll need to apply. But one gallon will cover an area 50 feet wide and 10 feet deep. And this product will handle all pests. Use it once a quarter when you're not growing plants. And once the garden is active, continue to spray at least once a month to ensure nothing "sneaks" up on you and gets established again. Here's a link to our meter which works great. Hi, I have a very bad infestation of whiteflies in my backyard lawn and 2 dogs. How long after application can I safely allow the dogs to go on the lawn? Thank you. This product uses an active commonly used in a range of pet products like Advantage II so its very safe for use around pets. In fact the Advantage is very strong (over 9%) and even at that strength its used directly on pet's fur and coat. Now once you dilute down the Adonis, it will be applied at .05% or at most, a .1% so it will be effectively be almost 100 times weaker compared to the same chemical you can apply directly to the dogs. This means it will pose no hazard. If anything, it will help them by killing any fleas or ticks on their paws. That being said, we always recommend letting lawn treatments "dry" for 1-2 hours. This ensures the treatment will have a chance to do its job before people or pets walking on it will destroy or alter the application. Our lawn is eaten up by army worms. Will this product kill the army worms and will they return? Will this product work on squash beetles/bugs? I’d like to use an effective but organic product. This is a great option for squash bugs. Its fast working, will repel them for a week or two and has a "one day to harvest" since its organic. Tags: DESCRIPTION, multi purpose, range.